These informal practices are what a court, tribunal or other adjudicator will look at when a complaint or legal challenge arises. With enforcement activity on the rise and employers continuing to make the same compliance mistakes over and over, now is a good time to think about getting your policies in order. If you read this blog regularly, then you know that some workplace policies are required by law. But do you know exactly which policies are required? These essential policies include workplace health and safety, violence and harassment, privacy, accommodation of disabilities, anti-discrimination, hours of work, attendance, overtime and more (depending on the jurisdiction). You probably also know that courts have told employers that a lack of policy harmed their case (even when the policy wasn’t required by law). Some tribunals have required employers who are found non-compliant to implement certain workplace policies and procedures (e.g., accommodation policy, anti-harassment/discrimination policy, progressive discipline policy among others). 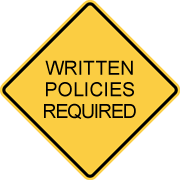 Do you have these policies in place? If you don’t, you’re placing your organization at risk. You can learn all of the HR policies that are required by Canadian laws and recommended by courts in our free whitepaper, Getting Started with the 11 HR Policies Required By Law (Plus 20 More that are Essential for Due Diligence). Download it here. You probably have some sort of written workplace protocols, like a code of conduct, a standard employment contract, pay practices, some things like that. But if you stop to think about it for a minute, are you sure that your practices—formal or informal—meet the requirements of the various employment-related laws? Of course, it’s essential to have the policies that are required by law so that you can demonstrate to inspectors or courts that you have complied and done your due diligence. But there is another more practical dimension to having policies. Policies help you understand what to do in the event of a workplace injury, a claim of harassment, a request for accommodation of disability, when an employee says you owe her overtime, how much to pay when an employee takes a vacation, when you want to terminate a problem employee—or want to let go of someone for no particular reason. Policies also communicate to employees what you expect from them, their entitlements and rights. Informal and unwritten practices can’t help you in your day-to-day operations. They also will not offer much protection when you face a legal challenge from an employee or a government inspector—or an audit—in terms of proving compliance. Legally compliant policies that are written down in a formal policy manual will provide the strong due diligence defence required to meet legal challenges to your HR practices and management. When you ensure you apply those policies consistently, then you can build a strong workplace culture of confidence and productivity without worrying that simple management actions will damage your business or land you in court. Keep in mind that no matter what you do at your workplace—whether your practices are formal and written down or informal and verbal—those are your workplace policies and those are what will be the basis of your legal defence. Our goal is to help you place your organization on a firm footing and support your employees through strong compliance, so that’s why we’re offering Getting Started with the 11 HR Policies Required By Law for free. Download your copy today.